How true the words of Robert Burns are (or at least the English translation of his poem ‘To a mouse’) “The best-laid plans of mice and men often go awry”. I had a nice clear plan of work and family commitments to take me up to my retirement at the end of August, at which point there would be parties and cream teas and a farewell service, after which I would slip into the blissful state of being in charge of my own diary. However, life has thrown me a curve ball (an image less familiar to Robert Burns) and plans have had to change. Back in September I noticed a very slight swelling in my neck. I was not overly concerned but thought it best to be on the safe side and go to the Doctor. The Doctor thought it was nothing of consequence but sent me for some tests just to be on the safe side. Well the safe side turned out to be the right side as at the end of February I was diagnosed as having a Lymphoma – cancer of the lymphatic, or immune system. The exact form of lymphoma is not yet known so I am still being treated as a pincushion and having many tests. A full diagnosis should be made in early April after which treatment can be scheduled. Just as an aside, there is a lesson here for all those people (usually men) who don’t want to bother the doctor – if you notice a change in your body or have a problem (no matter how insignificant you think it might be) go and get yourself checked. It’s better to waste the Doctor’s time with something that isn’t a problem than let something small turn into a big problem! I have been told I will have to have Chemotherapy, the only treatment for Lymphoma, which kills off the white blood cells in the immune system. This means that during the time of treatment and in the recovery period afterward I will be very susceptible to infections and will have to limit my contact with people, especially people who have a cold or might be brewing some form of infection. For this reason I will have to finish work much earlier than planned. So as not to leave the church in a state of uncertainty I thought it best to have a clear finish date, after which I will be on annual leave then sick leave. This is why I will be finishing (or by the time you read this will have finished) work on 31 March. All the information I have been given says that Chemotherapy for Lymphoma can make a person very ill but the success rate for treatment is very high. So, I am positive about the long-term future, but a bit apprehensive about the short-term period of treatment. There are so many things I planned to say and do over the next 5 months, so many stories to tell about my experiences in ministry (did I ever tell you about the groom who passed out in the middle of his marriage service and had to be taken to hospital in an ambulance – we did get him back just in time to finish the marriage). I will have to content myself with telling a few stories in the official leaving service, to be held at Christ Church, in the evening on Sunday 14 April. Over the next few months I will continue to live in the manse and may need support and help with practical things, like transport. I hope I can call for help if and when it is needed. For now I just want to say thank you for the friendship that you have shown to me during my time at Christ Church. It has been a privilege to be a part of your church family for the past seven and a half years, to share in your joys and sorrows and to travel the journey of faith with you. It has been a good place to serve and I will always treasure my time in Uxbridge. This entry was posted in Look-In on April 7, 2019 by admin. In June I returned to ‘normal duties’ following my sabbatical, which I wrote about in my last letter for Look-In way back in February. Due to family health problems things didn’t go entirely to plan (do they ever), but having the sabbatical when I did meant I was able to offer a lot more support to my parents and Sue’s parents than I would have been able to do under normal circumstances. Anyway, now life has returned to normal. Except it hasn’t. The last few weeks have shown a side of life that is far from normal. Terrorist attacks on Westminster Bridge, London Bridge and at the Manchester Arena; the attack on worshipers leaving a Mosque in Finsbury Park (was this a terrorist attack? It was certainly an attack designed to create terror); and the horrific fire in Grenfell Tower; not to mention the Brexit negotiations (oh dear, I mentioned them) have all shown that these are not normal times. All of these events cast a shadow of fear. And the way they are reported often deepens the sense of panic and fear people feel, mostly unintentionally but some less scrupulous media outlets do seem to delight in turning tragic and painful experiences into opportunities to increase the sense of fear that many people live with. It is very easy to imagine that, in the words of Private Fraser from Dad’s Army, ‘we’re all doomed’. How do we respond in the face of this climate of fear? Psychologists tell us there are two basic responses to fear, Fight and Flight – to run and hide or to turn and fight. Many want to run and hide – in fact it is one of the objectives of terrorism to make people run and hide, to disrupt normal social life, to cause people to want to stay at home and not go to public places, to cause society to grind to a halt. Some choose to fight – to become aggressive with words or actions. I have no idea what the motives of Darren Osborne were when he drove his van into the group of men outside the Finsbury Park Mosque but it does seem to me that it was an attempt at some misguided and misdirected form of fighting back. Faith though, I think, should offer us an alternative to Fight or Flight. So what does our faith say to us in a time of tragedy and fear? The first thing I note is that having faith does not take away either the fear or the pain of tragedy. Nor does it offer us some false platitude, it does not say, ‘there, there, it’ll be all right. It must be said, at its worst faith can itself be the source of fear (though personally I think it is often just a tool used by people with other motives). What I think faith can and should do is influence our perspective on a situation, colour our reactions and response, shape our frame of mind and direct our feelings. Faith can help us see beyond the attacks by a minority of Muslims, or Christians, to the vast majority who are peace loving and live side by side quite harmoniously. Faith can help us see that despite the reasons to fear there are far more reasons to hope, there are far more people doing good than doing harm, in the face of suffering and loss there always people willing to make sacrifices to help. Faith can change how we see things and in turn how we respond to tragedies. In that way Faith can give strength, to individuals and to communities. It can be the supporting rod that prevents us from bending and breaking under the pressure of fear. To keep the alliteration with Fear and Faith, faith gives Fortitude, strength not to buckle but to maintain hope and continue to live positively and courageously in times of fear. In these times of fear, may our faith be a source of fortitude. May we not listen to those voices that seek to make fear and terror fill our hearts but rather work to build a positive, strong and caring society. This entry was posted in Blog, Look-In and tagged look-in on July 5, 2017 by admin. At our Harvest Service last month, Nick spoke about bees and their importance in providing the food that we eat. Bees are essential for pollinating crops and other plants and it’s estimated that they play a key role in providing at least a third of the food that we eat, if not more. 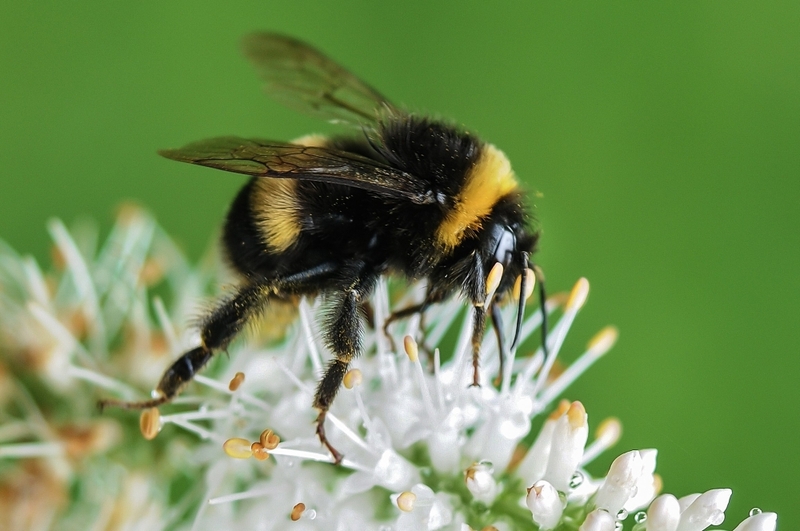 What is worrying though is the decline in the numbers of bees since the start of this century – since 2010 alone, the bee population has reduced by 45% in the UK, and this is thought to be mostly due to the use of pesticides. Two species of bee have become extinct in the UK since the start of the 21st century and several more are now endangered. Bees pollinate 80% of flowering plants on Earth and 70 of the top 100 human food crops. One single bee colony can pollinate 300 million flowers each day. 1 in 3 bites of food we eat is derived from plants pollinated by bees. Almonds are completely dependent on bee pollination; avocados, apples, and cherries are over 90% dependent on bee pollination and cucumbers, kiwis, and melon are majorly dependent on bee pollination. A threat to the bees is a threat to our own existence. It can be tempting, when faced with a huge problem like this, to bury our own heads in the sand. After all, what difference can just one person make? And whilst, on our own, it may seem we make very little difference, if we all stopped to play our part in helping the bees we could make a massive difference. Ask your council not to mow wildflower verges, and request that your friends and relatives do the same. Councils manage large areas of land and can make a positive contribution. For example, they can manage hedgerows sympathetically, and create pollinator gardens. Public pressure makes a difference. Think of your garden as a feeding station and safe-haven for bees. Make your garden bee-friendly, and include wildflowers in your garden. Plant hedgerows – some local wildlife and council groups will even give away native hedgerow species to encourage this. Plant hawthorne, prunus, ribes, honeysuckle, berberis and holly. Provide hollow canes for solitary bees and upturned plant pots beneath sheds for bumblebees to consider making a nest in. Don’t use pesticides, including on your lawn – bees may forage or nest in lawns. Please don’t use pesticides in your garden. Support organic wherever you can, or better still, grow your own organic food if possible, even on a small scale. We need to change our attitudes towards insect species and realise that most are beneficial or harmless. It seems we put much at risk for the sake of a few “pests” – the role and habits of which we may not fully understand, and in many cases, environmentally friendly alternatives are available. Please help raise awareness that most insect species are beneficial or harmless. Ask your local council and golf course not to use pesticides. Get involved! Campaign for changes to the system and bans of harmful pesticides by signing petitions, sharing with friends, writing to politicians and so on. A difficult one, other than being considerate in using the Earth’s resources as best you can. However, with regard to gardening, there are some things you can do to provide for bees in difficult conditions (within reason!) For example, if you live in a drought area, take this into account in your choice of plants and provide shallow water and damp mud for bees. This entry was posted in Look-In and tagged bees, look-in on October 14, 2016 by admin. The Church played a considerable part in our lives and the family were members of the Old Meeting House Congregational Church. My parents were married there and my Sister and I were christened by the Rev’d Luther Bouch. From the age of five we were taken to Sunday School each Sunday morning and again in the afternoon. At the end of Sunday school in the morning the children filed into the Church but only stayed for the first half of the service; we came out prior to the sermon. When Mother couldn’t take us in the mornings we were taken by Eva Keen, Ethel and Win Bright or Vera Newport; all lived locally to us. From about seven onward I was able to go alone. There was a considerable social side to the Church in those days. There was an annual outing usually to the seaside, such as Worthing, Littlehampton and Bognor. Also there were smaller outings to places such as Burnham Beeches, Newlands Corner or Boxhill. To take us on these outings Gregories charabancs were used, and they were open-topped with a canopy that could be pulled up if it rained. It had no side windows so one hoped the rain would come down straight, not to be blown sideways. Boys club took place each, Tuesday evening in the Sunday School building. We were well equipped for gymnastics, having a vaulting horse, horizontal and parallel bars etc. Len Fountain of Hillingdon House Farm was our instructor. We also used to play games of various kinds. I also learned to play billiards as there was a billiard table in one of the rooms behind the stage. The Church had tennis courts behind the Sunday school and therefore a keen tennis club. We had a very good choir, and apart from singing on Sundays they also gave concerts, usually an oratorio. There was, of course, a girls club. When I was nine or ten I was asked to blow the organ. I did this for some years. The organists were Norman Tyrell and Mrs. Elizabeth Taylor (Wife of Fred Taylor who was the Sunday School Superintendent). It was useful, as when blowing for Weddings I would often be given a Florin or Half-crown. From a very early age we played tops out in the road. There were two types of top, the Carrot top, shaped like a carrot and the T top, which I preferred. These tops were spun by a whip and then were gradually whipped up the road. There were, of course, contests to see who could make the top jump furthest. Hoops were also an attraction. There were wooden hoops and steel ones. These were approximately two feet in diameter and were bowled by hitting them with a stick or pushing them along with a stiff wire hook. Playing cigarette cards was another pastime, there were various games: on tops, unders and knock the card down which was propped up against a wall. From the age of eight children were able to join the Uxbridge Library club. The library then had recently moved into the old Cowley Road School. A very young Miss Humphreys read stories to us, and advised on which books we should read. When I f first went to Whitehall School there was only the infants school. At the rear of the playground was a tall fence, behind which were fields. In the summer for nature study we were taken out into the playground and through a green gate into the field. Here we were taught about the different wild flowers, and we were not encouraged to call them weeds. Whilst still in the infants school Rabbs Mill was burned down (February 1928). We were able to watch that from the school windows, having a very good view as my classroom was then upstairs. By the time I was eight the senior school had been built (28th August 1928) and so instead of going to Cowley Road School, we went to the new school. On the Rockingham Road side of the River Frays, behind the Prince of Wales pub and the cottages that side of the road, was Beasley the iron founders. They cast many parts for agricultural machinery which was made by several companies locally. Beasley’s owned a small field adjacent to the foundry buildings. They used to put unwanted large pieces of equipment out in the field, so this was an ideal playground for children and the owners did not mind us using it. This area was known locally as ‘The Old Irons’. We got up to all sorts of things there. The most popular being digging large holes and using old corrugated iron for a roof, these were our caves. Lighting bonfires was, of course, very popular. When we were a little older and had bicycles, what better place to make a race track and for good measure put some ramps in it to see who could jump the furthest. I mentioned the allotments earlier. These did not last long in my life. Came the day when it was decided to make the Fassnidge Memorial Ground. I remember watching two great agricultural engines, one each side of the area. There was a four-bladed plough which was pulled from side to side by the engines with a heavy hawser loop. They leveled the whole area in two days. The Fassnidge Memorial Ground was opened on 27th October, 1926. At a later date the Rockingham recreation ground was leveled, but this time by a traction engine with a gyro tiller at its rear. This consisted of a number of blades mounted vertically on a heavy wheel, the blades were then pushed into the ground and the wheel was rotated as the engine went along. A large number of allotments were lost in forming these two recreation grounds. This article is part of an ongoing series. Please click the links below to read previous parts of the story. This entry was posted in Look-In and tagged look-in on April 30, 2016 by admin. Christian Aid’s ‘Count your Blessings’ plan, daily bite-size reflections to inspire us to give, act and pray to bring justice to our world and change the lives of people living in poverty across the globe. Water Aid’s ‘Jars of Change’ appeal, turning loose change into clean water. Practical Action’s ‘Human Waste’ campaign, tackling problems faced by toilet-pit cleaners in Bangladesh. And some have followed the ‘40Acts’ programme, encouraging people to give back, do good and live generously. This year, as there were several other things happening in the church, we did not have any organised Lenten appeal. However, that does not mean we don’t want to have a special appeal this year. The question is when? Having an appeal during Lent introduces a sense of sacrifice in our donation, but in some ways thanksgiving is a better reason for giving that sacrifice. The Sundays following Easter are a time of celebration and thanksgiving, so it occurred to me that this is as good a time as Lent to have a special appeal. So, subject to the agreement of the Members’ Meeting on 3rd April we will launch a special appeal to raise money for a marula fruit nut cracker. The marula tree is able to survive in drought-affected areas and its fruit can be used to make cosmetics and beer as well as being a source of food, oil and vitamin C. However, the nut containing the fruit is hard to crack. Traditionally this has been done by hand, but this is slow and leads to accidents. Engineers at Practical Action have designed a machine to crack the nuts safely and at greater speed. The machine can transform the lives of women in rural Zimbabwe. The nut-cracker can lead to people having a new life, which, incidentally, is the theme for the Sundays between Easter and Pentecost this year. This entry was posted in Look-In and tagged look-in on April 4, 2016 by admin. I was born in a house in New Windsor Street in October, 1920. The house was one of a terrace and had three bedrooms and a bathroom upstairs. The bathroom had no hot water and the bath was so large that to get sufficient hot water for a bath would have meant carrying probably 10 to 15 buckets up the stairs. In any case there was no means of heating such a quantity. A tin bath in the kitchen was therefore used for bathing. There were two reception rooms, a kitchen and scullery downstairs. The only WC was outside but actually built into the house abutting into the scullery. The weekly rent was ten shillings. Cooking was carried out on a cast-iron cooking range in the kitchen. As a schoolboy my job each Saturday was to black-lead the range and polish the fire irons with emery cloth. There was a brick-built boiler in the scullery which was used for the weekly wash, and outside the kitchen door was a very large wooden-rollered mangle to squeeze most of the water from the clothes. From a childs play point of view one should remember that there was very little traffic on the roads and half of that was horse-drawn. Also, in those days there was not the danger from pedophiles and other bad types as abound now. It was quite safe for children to roam far and wide. There was no television and only the lucky people had a wireless set and then mainly only a crystal set. This was just after the First World War; jobs were scarce and therefore so was money. Radio was not as today; in 1920 it consisted of Marconi test transmissions and other amateurs testing. The first proper service was the British Broadcasting Company broadcasting from Savoy Hill in 1922. One heard “This is 2L0 calling” “from the BBC”. This was an almost National service but only transmitting between certain hours each day, mainly evenings. This service was gradually extended and became known as the National Service. Sometime later regional services started, giving people a choice. Some of my earliest memories, probably before I was five years old, were of being taken to my Father’s allotment which was situated where the Fassnidge Memorial Ground is now. The allotment was approximately in the position of the bowling green. The whole of the memorial ground area was allotments in those days. Most of the allotments had a well as it was only necessary to dig a hole about twice the diameter of a bucket and three to four feet deep. This would contain about a foot of water as the water table was not very far down in that area. As my Father was a keen fisherman, I was also taken fishing, mainly to the dock behind Fountain’s mill and occasionally to the canal near the Swan & Bottle. I well remember being taken to start school when I was five. This was to Whitehall school in the infants class. Miss Harvey was the teacher. My Mother had taken me and when morning playtime came along I thought it was going home time, and so home I went. As my Mother had gone shopping on the way home, she found me on the doorstep when she returned. Needless to say I was returned after lunch. In those days, of course, it was normal for children to go home for a meal at lunchtime, there was a two hour break from 12 until 2 o’clock. It should be remembered that most women did not work then and so were at home when the child arrived. Normally lunch would be the main meal of the day (we knew it as dinner) later was teatime, and then supper in the later evening. On special days we would have toasted crumpets or muffins for tea. These were bought from the Muffin and Crumpet man who walked the streets with a large tray of those things on his head; it was always covered with a green cloth. As he walked he rang a bell to let people know he was in the area. While talking about delivery people e.g. dairies in this area mainly belonged to local farmers, the large combine dairies were not around at that time. Milk was taken round in two-wheel carts called milk floats. In the centre of the float was a very large milk churn and to obtain milk, people had to go out to the float with their jugs. The milkman had a half and a one pint measure which he used to dispense the milk. These measures had a long hooked handle and were hung on the side of the churns when not in use. My great friends at that early age were Les Marsh, the youngest son of the Marsh family who ran the Hercies farm dairy (Les was well known after the war as the manager of Charrington’s coal depot. He had started with the company on leaving school). Also Tim Smith, who after the war became a teacher at St. Andrews school. He, unfortunately, died very young and Guy Pearce, Son of Cecil Pearce of fish shop fame. This entry was posted in Look-In and tagged look-in on March 31, 2016 by admin. Nick asks ‘what is the purpose of the Church?’ As ever, he was thought provoking and so I’ve been thinking! It’s a huge question and I dissent from nothing that Nick preached and has written. Perhaps the purpose of the Church is to be prophetic? To move ahead of the social climate into accepting the marginalised and the outcast. But, woefully, it is often the Church that lags behind and drags its feet. Its record with LGBT people is poor. It took decades to come to terms with divorce (and the Roman Catholics still haven’t. Methodism for a long time refused its pulpits to divorcees. Its attitude to unmarried mothers has been less than warm. It has been slow to build bridges to those of other faiths and of none. It so often prefers to keep its head down, to be invisible, so as not to be ‘controversial’. Instead it could have outpaced society as it made clear its wish to accept people where they are. We at Christ Church had an opportunity with our reflection on Living with Difference. The answers to our questionnaire showed that in many ways we were ahead of the game. Did we make them known to other churches, the local press, the library users, Brunel students? No! We put the answers in a cupboard! With some exceptions, churches seem not filled with people with feet on the accelerator but rather with people whose feet hover near the brake. We want everything kept as it is and we want to open our doors to people just like those inside and not to people who might press us to change. We don’t want to engage in debating the things that matter to those outside our walls and relate them to our faith. We want a bolt hole, a comfort zone. To many in the churches it is still ‘gentle Jesus meek and mild’. But Jesus of Nazareth wasn’t like that. He was a revolutionary. He said some tough and controversial things. Look at Matthew 10 v 34. He was seen as a threat and killed for it. So what would be the reaction of the churches if he returned now? Yes, it is the purpose of the Church to continue the mission of Jesus, the real Jesus. The tough guy who caused upset and demanded change and befriended people that no-one else wanted to know. But what would the first ten people asked in Uxbridge High Street say was the purpose of the Church? I am frequently assailed by people who ask how I can belong to the Church. I am told that it is stuffy, reactionary, that it has outlived its place in history, that it is dying on its feet. I argue back. What would YOU say? P.S. By the way when I use a capital C I mean the whole Christian Church in the world not just us at Christ Church, Uxbridge! This entry was posted in Look-In and tagged look-in on March 20, 2016 by admin. In March we continue the journey through Lent to Palm Sunday, Holy Week and Easter. The stories we tell at this time of year are vivid and full of powerful emotions. I’m not quite sure whether it is one of the blessings or one of the curses of faith that we live with the emotions of the moment but we also see the stories of faith with the insight of hindsight. We know what comes on Easter Day so some of the terror and loss of Good Friday is lost on us. After Jesus’ death his followers were scattered, Judas racked with the shame of betrayal, Peter with the guilt of denial, and the others just lost in grief and fear. Eventually they come together in a private room, not in anticipation but with the stunned disbelief of those whose world has just fallen apart. The day between Good Friday and Easter Day is known as Holy Saturday. For the first disciples it was not a day of waiting for resurrection. It was a day of wondering ‘What now?’ Later tradition imagined Jesus descending to hell on that day and bringing salvation to the righteous who had died since the beginning of the world but before the time of Jesus. But for those first followers this was not a time of hopeful waiting sandwiched between crucifixion and resurrection, death and life. For those disciples, who had to live in the emotion of the moment and did not have the benefit of hindsight, this would have been a time of desolation, of total loss. I hope that you are by now aware that there will be an exhibition of sculptures in the church in March with the title ‘Good Grief’. This exhibition provides an opportunity not only to see some powerful art but also to reflect on the emotions that people experience around times of grief and loss – which might be experienced in many situations, not just following a death. Within the programme of events around the exhibition there will be a special service on the Holy Saturday for those who have experienced grief and loss. I am calling the service ‘Thanks for the memory’. Hopefully there will be memories to give thanks for but it is important also to recognise that for some the dominant emotion are not always thankfulness. Anger, bitterness and pain are part of the emotions of the moment that we often cannot see beyond. Without wishing to deny the reality of these emotions it is hoped that the exhibition and the ‘Thanks for the Memories’ service will help us understand that, as in the Easter story, the desolation of death and loss are not the end of the story; God’s love can lead us to a place of healing and peace. This entry was posted in Look-In and tagged look-in on March 9, 2016 by admin. During the last few weeks of Lent this year there will be an exhibition of sculptures in Christ Church on the theme of grief. If you are interested in helping in any way with the planning and staging of this exhibition, or just being available to talk with people, then please contact Nick Skelding. This year’s Walk of Witness is organised by Our Lady of Lourdes and The Salvation Army Church. The walk will start at The Salvation Army Church, Cowley Road, UB8 2LT and finish at Christ Church where refreshments will be served. 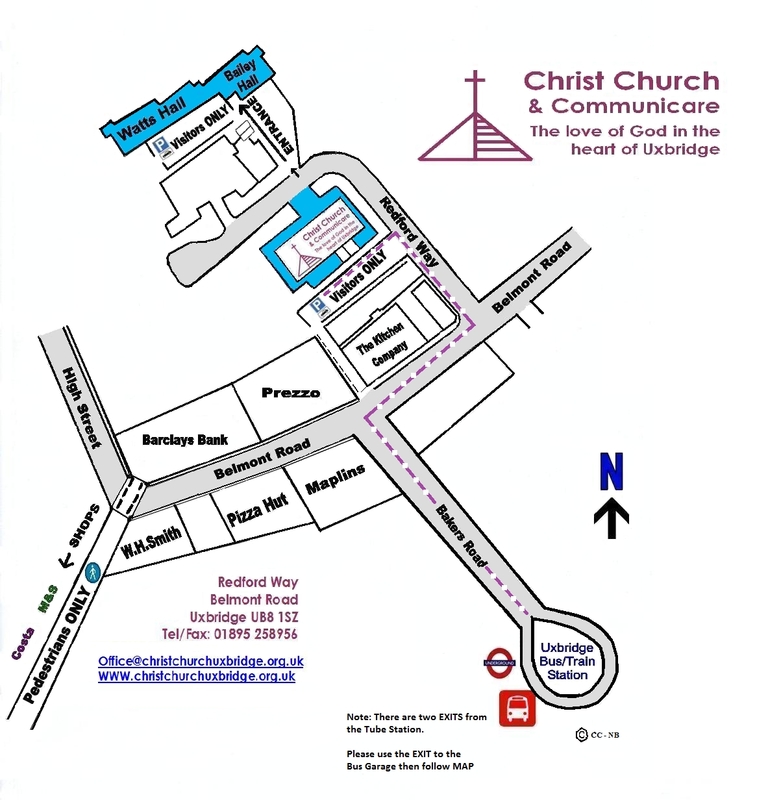 On Good Friday March 25th there will be a Circuit service of word and music, including the cantata ‘Olivet to Calvary’, at Pinner Methodist Church at 6pm. Rehearsals for the choir will take place at Pinner Methodist Church on Sunday afternoons 6th, 13th, 20th March and on Good Friday at 2.30pm. Contact Shirley Askew 1923 821871 asq28@icloud.com. Don’t forget, we have once again signed up to Sainsbury’s Active Kids voucher scheme. Active Kids vouchers are available every time you shop in store at Sainsbury’s and spend £10 or more. Active Kids vouchers can be collected from now until Tuesday 3rd May 2016. Please bring them along and place them in our collecting box in the meeting area. Life in the Spirit Course: ‘The Gift’ at Our Lady of Lourdes. The course is aimed at helping us to be able to open the ‘Gift’ of the Holy Spirit we received at Baptism and Confirmation. All are welcome. The meeting will be held on Mondays from 7.30 pm to 9.00 pm on 29th February and 7th /14th /21st March. New Flower Rota is now available so if you would like to donate flowers for a particular week, please sign up. If you would like to do the arrangement yourself, then please also sign in the Arranger column. Any further details please contact Mary Glasgow. Christian Aid Week starts on the 15th May. If anyone would like to help with the house to house collections and has a suggestion for other fund raising activities for supporting this event , please speak to Peter King. 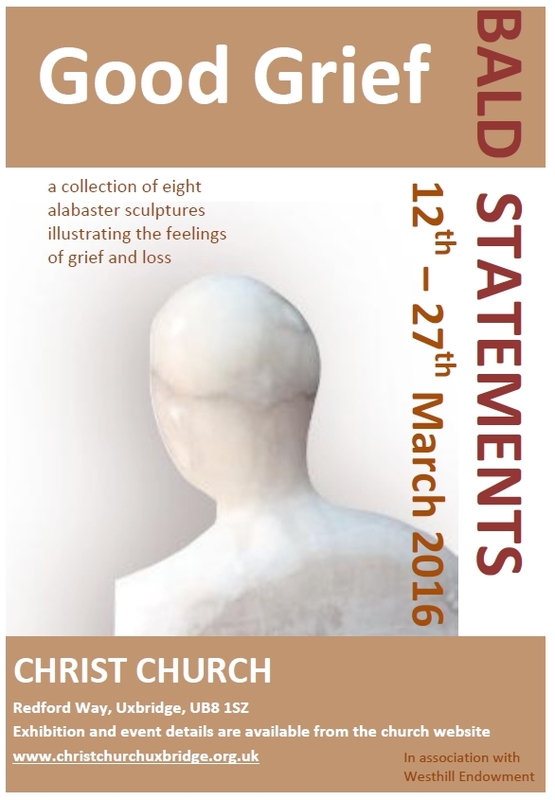 From 12th to 27th March 2016, Christ Church is hosting an exhibition featuring a collection of eight sculptures illustrating the feelings of grief and loss. The sculptures in this exhibition were born as a reflection of Jean Parker’s own experience of cancer. The eight terracotta heads emerged during the course of a seven-day silent retreat, and present a powerful and unique visual exploration of the grief process. These relate not only to loss of health, but also to significant loss of any kind. The hope is that the exhibition will help stimulate discussion and the understanding of powerful emotions, which can feel overwhelming. To see these images as transitional stages and part of a natural process experienced by many may prove helpful and reassuring, offering glimpses of hope when all seems lost. The emotions expressed in the sculptures – Denial, Disbelief, Questioning, Anger, Depression, Acceptance, Healing and Peace – are all part of this natural process. Grief is a journey everyone makes at some time. It is the aim of this exhibition to enable that to be a journey towards Peace. This entry was posted in Look-In and tagged look-in on February 25, 2016 by admin.